"Connie loved the Shain Show cards. And so did many other people. They had the biggest show night in a very long time. Their long time bartender told Connie that it was like the old days." So maybe direct mail isn't dead, after all! 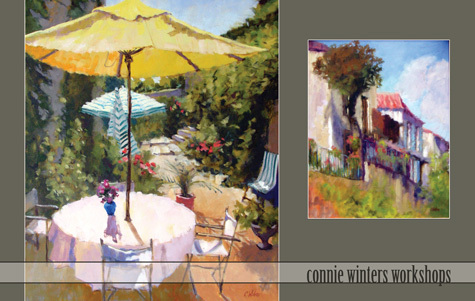 Charlotte area artist Connie Winters takes a group of students to Brantome, France, each year for a popular oil painting workshop. I helped her and workshop manager Sharon Schwenk (also a talented artist) with this promotional postcard.